European awareness of Somaliland, its history and development efforts is clearly on the rise. On the occasion of a working visit to the UK, Mr. Abdiasis Agaweyne, deputy mayor of Hargeisa, had the opportunity to meet with key political figures including Labour Leader Jeremy Corbyn and Bristol mayor George Ferguson. Meanwhile, Danish involvement in development projects in Somaliland is increasing. Deputy Mayor of Hargeisa Hon. 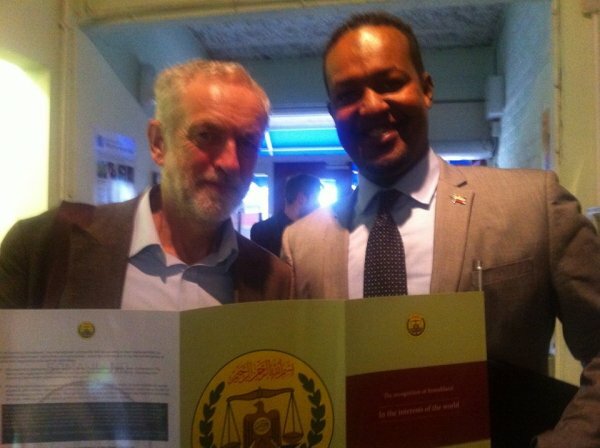 Abdiasis Agaweyne who is on working visit to the UK has met with Labour Leader, Jeremy Corbyn who paid a visit to Bristol. Hargeisa DM has briefed the leader about the history and stages that Somaliland went through and submitted reports on Somaliland. Mr. Jeremy told that he is fully aware of Somaliland history. On the other hand, deputy mayor of Hargeisa has met with Bristol mayor who was elected to office, George Ferguson and submitted reports about Somaliland to him. Mr. Agaweyne has given full briefing of Bristol mayor on Somaliland’s town councils. He also met with Head of police in Bristol and other important politicians. Ms. Hibak, Bristol councilor has faciliated the meeting that DM held with Bristol mayor and labour party leader. The awareness about Somaliland is increasing among citizens in Denmark and more and more Danes are getting aware Somaliland is different from SouthCentral and Mogadishu. This was informed by the Danish International Development Agency-DANIDA Somaliland country office program coordinator Michael Thyge Poulsen during an interview with Somalilandsun in Hargeisa where he briefed on the multi-faceted support by the government of Denmark and by Danish NGO's. On the increased awareness of Somaliland by Danish citizens Mr Poulsen cited that hopefully more than 700. 000 USD contributions by high school students in his country that will be accrued from Operation Day's Work and contributed to five local schools in the country. The concept is for the schools to allow the students to leave their high school and work for a single day. The pay for this day of work goes to whatever charity the organization behind the national committee decides. Originally it was called "A Day for Dag". Operation Day's Work is a charity program based on volunteering by high school students and an idea that originates from Sweden where it was established in order to honour the former Secretary-General of the United Nations, Dag Hammarskjold. Operation Day Work Denmark was established in 1984. Danida country chief with Saeed Hussein and Simon Prahm of Game Denmark and DG youth and sports ministry at Timaade grounds Hargeisa SomalilandDanida country chief with Saeed Hussein and Simon Prahm of Game Denmark and DG youth and sports ministry at Timaade grounds Hargeisa SomalilandDanida which is the development arm of the Danish Ministry of Foreign Affairs is the only foreign development agency with full time international l staff coordinating its external aid in Somaliland. The office oversees, coordinates and monitors implementation of the Somalia Country in Somaliland and to some extent in Puntland. The programme focus Governance, Inclusive Economic Growth; and Somali Compact Support - Financing Windows in which local intervention based on the Somaliland Special Arrangements (SSA) and the Somali Compact. SSA is a partnership based on the relationship between Somaliland and the international community which was established at the 2013 Brussels Conference, during the presentation and endorsement of the Somali Compact. Denmark's development engagement is based on the aspiration to contribute to a stable country that will be able to cater for its own security and build institutions that can foster an inclusive economic, social and environmental sustainable development that assures individual security, the rights of the individual, and creates improved livelihood conditions. "To facilitate this in our local programs in Somaliland approximately half of the over $70m are expected to be allocated The Somalia Country Programme (SCP) 2015 to 2018”. The Denmark SCP is composed of the following thematic areas. To consolidate basic governance institutions at the local and national levels, in line with a long-term ambition for Somalia to develop transparent, participatory and accountable government institutions, systems, and practices. To initiate sustainable and inclusive poverty reduction and economic growth by supporting basic regulatory frameworks and capacities, private sector opportunities and critical sector value chains. To support multi-donor mechanisms that advance Somali Compact results in inclusive politics, economic foundations, revenue-raising and service delivery. Michael emphasised that he finds the working environment in Somaliland very good and conducive. There is a frank and open working relationship with the Government and the civil society, as well as good coordination between the donors operating here. He is of course from time to time confronted with the issue of international recognition of the Republic of Somaliland and points of views are exchanged, but it does not as such impact the day to work and cooperation. On the issue of impact of the past and on-going activities Michael is confident that the support makes a difference. One example is the reduced traveling time between Hargeisa and Berbera as the road is being rehabilitated with support from Somaliland Development Fund (SDF), to which Denmark Contributes. Another example will be the increased access to safe and affordable drinking water in regions of Somaliland, again through the support to SDF. Through its Inclusive economic growth and the specific support to the livestock value chain Danida supports the IGAD Sheikh Veterinary School, the Chamber of Commerce, the Quality Control Commission and the Ministry of Livestock. The Italian NGO Terra Nova has been implementing this support for Danida during the last 3 years. The graduates from the Sheikh Veterinary School are very competitive in job market due to high skills accrued and are actual playing an important role in both the public and private sectors thereby contributing to the livestock industry which is the economic mainstay of Somaliland. Furthermore the programme supports the research capacity of the school. with Barwaani the ED of new partner sonsafwith Barwaani the ED of new partner sonsafThe Somaliland chamber of commerce and agriculture (CC&A) and the Quality Control Commission (QCC) also a beneficiary of the Inclusive Economic Growth that aim is to create a conducive environment for the private sector through better regulation, public investment in critical infrastructure, increasing government revenue efficiently and contributing to poverty reduction through strengthened resilience and improved livelihood for the most vulnerable people. Danida is also supporting inclusive economic growth through the World Bank business sector programme, with the objective to improve access to markets and generate employment in key productive and service sectors. One of the probably most well know project under this programme was Somaliland Business, which supported 174 small and medium sized enterprises. In the 2015-2018 SCP the World Bank support to small and medium sized companies will continue through -the "Catalytic fund" -that shall infuse businesses grants to local entrepreneurs as an economic growth stimulus that shall translate in creation of much employment opportunities necessary for poverty alleviation. On its multi-pronged partnership with the government of Somaliland Danida is actively engaged in the Somaliland Development Fund (SDF) which was originally established with funding from Denmark and UK when it was recognised that the government of Somaliland (GOSL) lacked the capacity to design, prioritise, finance and implement development projects. Later Norway and the Netherlands have joined the fund. SDF is the GOSL's preferred vehicle for receiving and channelling development funds, as defined in the SSA. Unecumbered by strange clan based politics and the non recogntion of Somaliland for Poulsen and his Danida the sky is thew limit Unecumbered by strange clan based politics and the non recogntion of Somaliland for Poulsen and his Danida the sky is thew limit From the above it might be construed, wrongly, that Danida only channels its program funds through the government but in the contrary a number of international and local NGO's are implementing partners. Danida has previously supported Academy for Peace and Development-APD that has been an active partner in the democratization process through implementation of civic education as well as voter registration and related research. n the 2015-18 programs new partners include the Somaliland Non-State Actors Forum –Sonsaf and safer world that shall implement activities revolving around the forthcoming parliamentary and presidential elections slated for Somaliland in March 2017. Others NGO's include Save the children Denmark receives 75% of its local operational and program funds from Danida while Danish Refugee agency-DRC and a number of others are availed substantial budgetary subsidizes. This funding is provided by Danida though it Civil Society funds and is in addition to what is provided through the SCP. Asked if he would like his family and friends to visit Somaliland the country program coordinator says that he will be more than happy to introduce them to this hospital people, their culture and fascinating country.